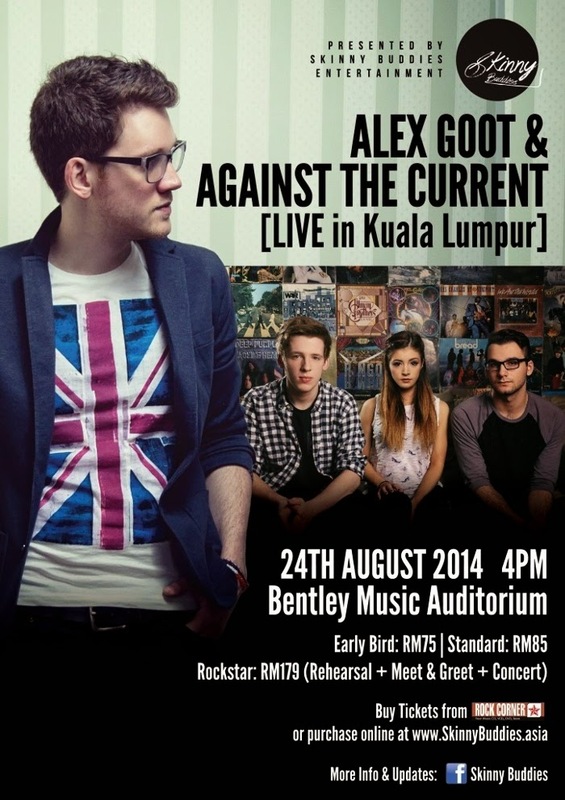 26th July 2014, Kuala Lumpur- Attention to all Malaysia music lovers, you will be in for a treat as rising independent acts Alex Goot & Against The Current are making their way to our country next month. This is event is organized by upstart digital age concert promoters Skinny Buddies Entertainment and is supported by Youtube Malaysia. This highly anticipated concert will be held in KL at Bentley Music Auditorium in Wisma Bentley Music, Damansara Mutiara at 4.00pm on 24th August 2014! Alex Goot is a very prominent multi-talented independent pop artiste with four studio albums to his credit, who rose to fame by utilizing the power of Youtube and social media. Against The Current is an equally exciting pop rock band that has made similar strides tapping on platforms like YouTube. Forming this band include Chrissy Constanza, Dan Grow and Will Ferri. These two acts have collaborated with each other before and created hits with covers like “Catch My Breath”, “Not Over You” and “Beauty and The Beat”, which has raked them over 58 Million views to date. Held on 24th July 2014. Rockstar Ticket Sold Out! Only Free Standing Ticket Left! But fret not, as the free standing tickets are still available and it is selling fast. Do grab it before it’s too late! Local acts and Emcee announced! Apart from Alex Goot and Against The Current, the concert will also be supported by some local acts which include Malaysia’s award winning pop funk favourites, An Honest Mistake and Skyward, whose singer is Ming Han, who is also a rising Malaysia youtubers with over 157,000 subscribers on his channel TheMingThing. As for emcee, Mark O’Dea from 8tv quickie will be hosting the concert! Ming Han and his brother Ming Yue from TheMingThing have attended the press conference that day. Some media members have voiced out the question regarding how he first started up his Youtube career. He mentioned that he first started out by uploading a video of him complaining about his university car park. The video ended up getting a lot of views. Being a youtuber has helped him in getting a lot of working opportunity which he has now. He even owns a creative studio now. Darren Teh from “An Honest Mistake”Shared on How Youtube Has Affected Music Industry Nowadays! Darren Teh from “An Honest Mistake” has shared with us regarding how Youtube has affected the music industry nowadays. With Youtube and other social media, they were able to have an extra reach. They have uploaded their practice videos, music videos and etc to youtube. Some of the people have been seeking for how it would be like when a band is jamming. Thus, the videos he uploaded actually helped these people learn more about it. Apart from being an entertainment platform, Youtube is a good source for education. Tickets for the Malaysian show will be available online at www.tickethotline.com or from selected Rock Corner outlets and are priced at RM 85 (Free Standing) each. Early Birds tickets and premium Rockstar tickets which were released earlier have already been sold out. Fans are advised to buy their tickets early to avoid any disappointments due to the limited number of slots available for this wonderful concert. The press conference was held in Google Malaysia. It is indeed a lovely place to work in. Hopefully I can attend a press conference in Google Malaysia again next time!